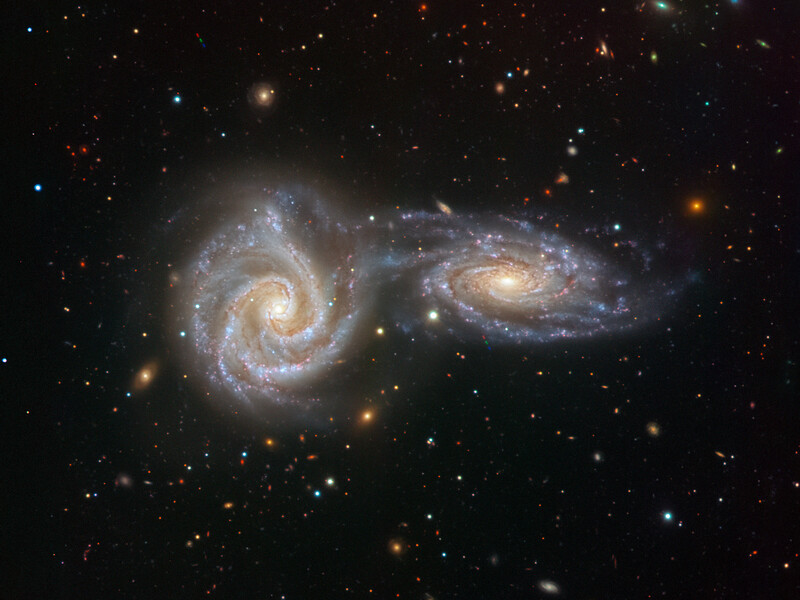 Two spiral galaxies are locked in a spellbinding, swirling dance in this image from the VIMOS instrument on ESO’s Very Large Telescope (VLT). 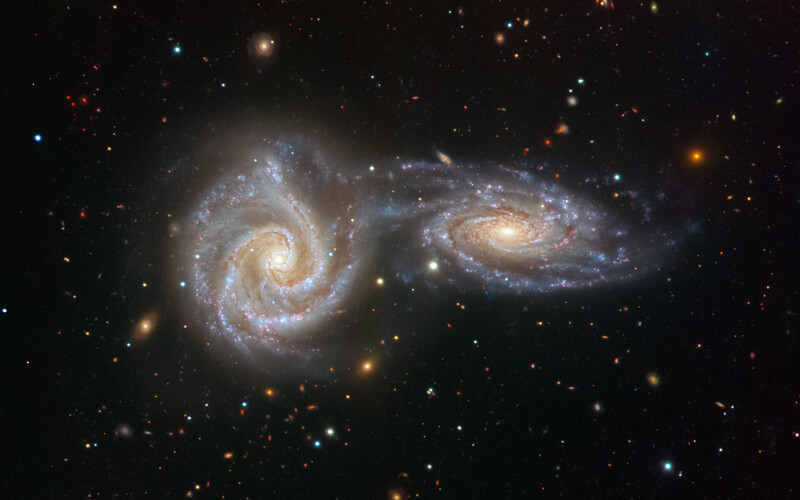 The two interacting galaxies — NGC 5426 and NGC 5427 — together form an intriguing astronomical object named Arp 271, the subject of this, the final image captured by VIMOS before it was decommissioned on 24 March 2018. VIMOS — or, in full, the VIsible Multi-Object Spectrograph — was active on the VLT for an impressive 16 years. During that time it helped scientists to uncover the wild early lives of massive galaxies, observe awe-inspiring triple-galaxy interactions, and explore deep cosmic questions such as how the Universe’s most massive galaxies grew so large. 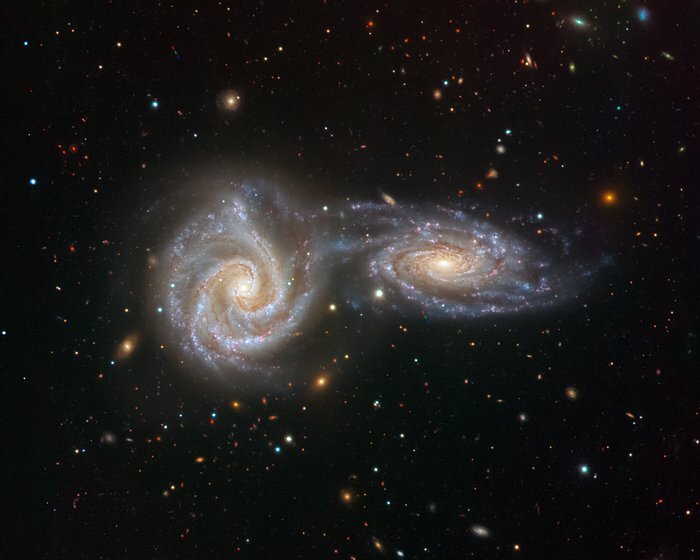 Instead of focusing on single objects, VIMOS was able to capture detailed information about hundreds of galaxies at once. This sensitive instrument collected the spectra of tens of thousands of galaxies throughout the Universe, showing how they formed, grew, and evolved. Arp 271 is framed against a backdrop of distant galaxies in this view, and wisps of bluish gas, dust and young stars can be seen bridging the gap between the two galaxies — a result of their mutual gravitational interaction. Like many astronomical observations, this image looks back in time. Thanks to the vast gulf of space separating the Earth and Arp 271, this image shows how the galaxies looked over 110 million years ago: the amount of time it has taken their light to reach us. This kind of collision and merger is also thought to be the eventual fate of the Milky Way, which scientists believe will undergo a similar interaction with our neighbouring galaxy Andromeda. Position (Dec): -6° 3' 1.57"